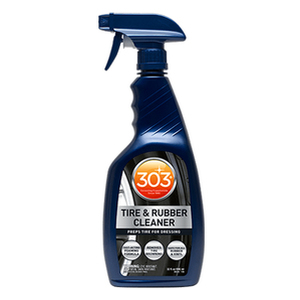 303 Tyre and Rubber Cleaner effectively cleans tyres and other rubber parts on your vehicle. This fast acting formula removes tyre browning, dirt, grime, and any other road particles quickly and easily. 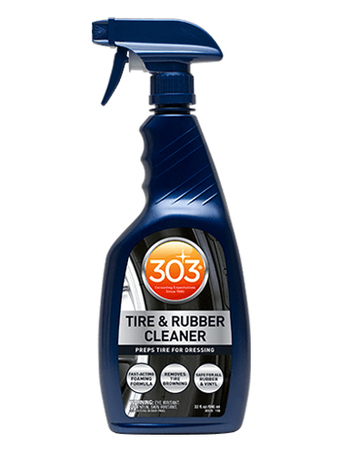 303 Tyre and Rubber Cleaner changes colour as it works. The change of colour indicates that dirt is being removed. It is safe to use on all wheel types and will in fact clean wheels as well as tyres. This product is great for cleaning tyres and other rubber parts, especially rubber floor mats. Spray the product directly onto the surface. Once the product comes into contact with dirt and grime it will change colour, this is showing you the formula in action. Let this do its job for 1-2 minutes, use a semi course brush to remove any stubborn grime, then rinse thoroughly with water. This product is safe on all rubber, vinyl, and wheels.